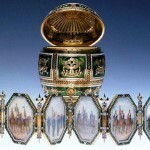 In fact, Faberge Easter eggs became a legend in the art world and a part of Russian history. Inside each egg there are hidden surprises. However their true value is not in it, nor even in precious stones, decorating the egg. They are in a touching reminder of the tradition. In particular, historical scenes of the holy coronation, and the reign of Nicholas II. 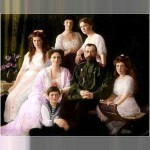 In addition, in the portraits of the vanished royal family of nine – Czar Nicholas II, Empress Alexandra, Tsarevich Alexei, Grand Duchesses Olga, Tatiana Nikolaevna, Maria Nikolaevna and Anastasia Nikolaevna… Later killed in the basement, in the mine, in the field – anywhere. 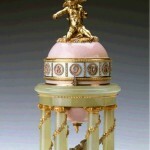 ‘300 years of the Romanov dynasty’ Easter Egg of Gold, silver, diamonds, faceted rose, purpurin, steel, glass and bone. Dimensions – 19.0 cm. 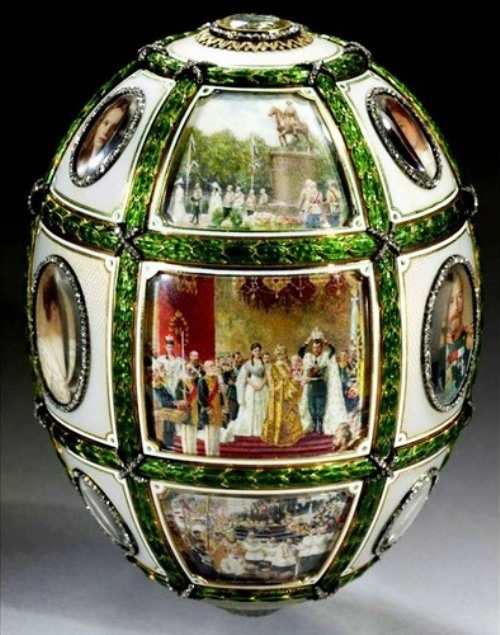 The egg, made to the tercentenary of the Romanov dynasty, decorated with miniature portraits of representatives of eighteen reigning dynasty. At the top and bottom of the egg fortified flat diamonds, visible through the date “1613” and “1913”. Inside the fortified egg rotating steel burnished globe, which posted double-gold trim an image of the Northern Hemisphere. In particular, on one thing – gold color designated area within the borders of Russia in 1613, on the other – within the borders of 1913. Meanwhile, in the decoration of eggs, dedicated to the 300th anniversary of the ruling Dynasty, heavily used elements of state symbols. The surface of the egg in the space between the thumbnail in the diamond framework -decorated with embossed heraldic royal crowns. Base is cast silver gilt figure of the eagle, mounted on a round base of purpurin, simulating the state board. Presented by emperor Nicholas II, to Empress Alexandra Feodorovna on Easter 1913. Received from the People’s Commissariat of Foreign Exchange Fund in 1927, stored in the State Museums of the Kremlin. Done in gold, platinum, diamonds, rock crystal, lapis – lazuli. 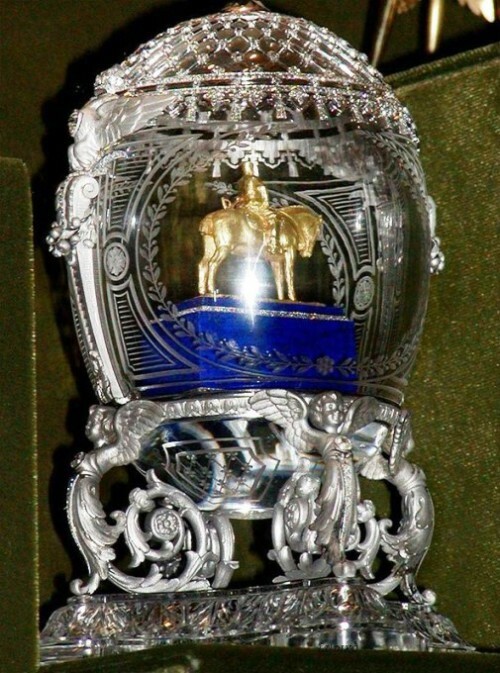 On top of a large diamond fastened, through which is visible the date “1910.” The stand is a four winged figures of platinum, mounted on a crystal base. 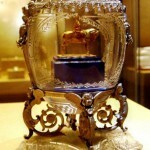 In the case of gold embedded model of the monument to the emperor. In fact, it is the model of the monument to the emperor made by Paolo Trubetskoy. Presented to Maria Feodorovna on Easter in 1910, stored in the Armory. 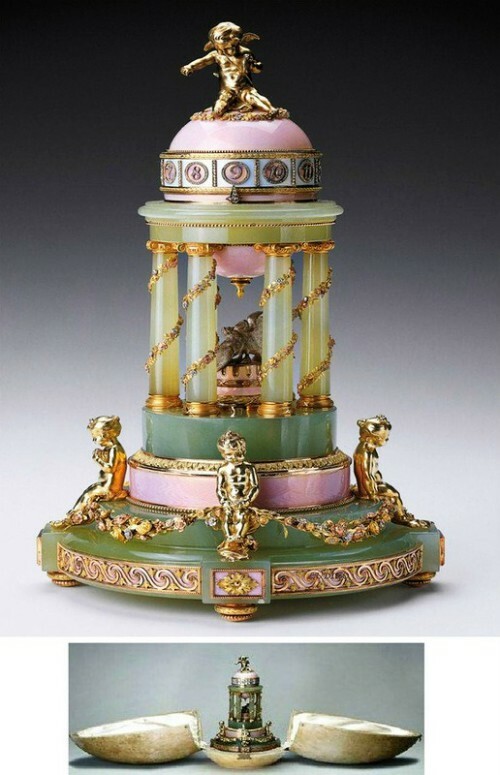 In the manufacture of eggs masters used colored gold, diamonds, and platinum. The egg conceived as a temple of love in Arcadia. 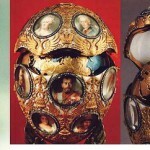 In fact, the Egg-clock – made in memory of the long-awaited birth of Prince Alexei, the heir to the Russian throne. Covered with a transparent pink enamel, and the dial the numbers decorated with diamonds. 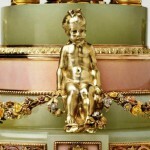 Meanwhile, located on the egg Gilded Cupid – an allegory of the prince. Green Colonnade supports the egg and from it the hour hand comes. Flower garlands made of gold and decorated with colored diamonds. In the center of the colonnade – two platinum Doves. 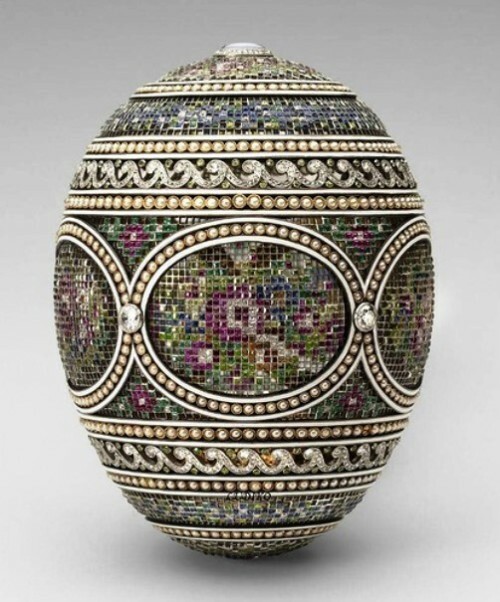 Eggs given by Emperor Nicholas II to his wife, Empress Alexandra Feodorovna on Easter 1905. Stored in the collection of Queen Elizabeth II. ‘Laurel tree’, also known as the “orange tree”. 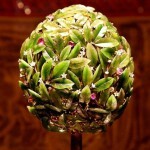 Egg made in the form of a tree trimmed with a dense canopy of leaves with jade flowers and fruits of precious stones, with petals of white enamel: champagne-colored diamonds, amethyst, ruby and pale citrine. In foliage hid the key hole and a tiny lever, actuation of which raises a round cap on top of the tree, and then comes inside songbird, which flaps its wings, turns its head and sings, opening its beak. Carving on gold mimics the trunk bark. 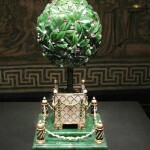 The tree “grows” from a golden ground, pour into a square of white quartz tub, decorated with gold trellis lattice with heads of flowers at the intersection, a garland of laurel bill – transparent green enamel with berries of rubies, cabochons, surrounded by diamonds. 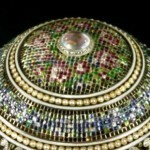 Each foot tub is also adorned with rubies, diamonds, gold rosettes placed in the corners of tub filled with pearls. Inside the tree crown there’s a bird. 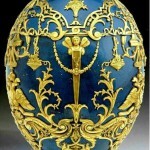 This egg – a gift from the Emperor Maria Feodorovna. 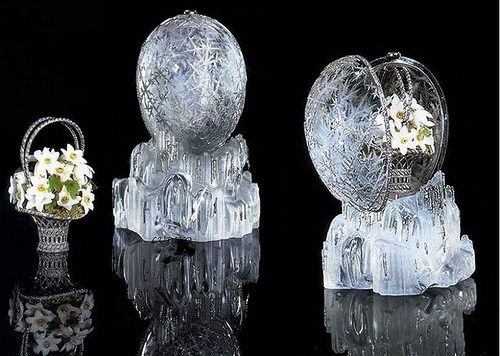 The egg was confiscated in 1917 and transferred from the Anichkov Palace to the Moscow Kremlin. This is one of the nine imperial Easter eggs, which were sold in 1927. Since then it has passed five different owners, and finally was sold to Mrs Mildred Kaplan, Malcolm Forbes in 1965 for 35 thousand dollars. Now it is stored in the collection of Vekselberg. The ‘Fifteenth Anniversary of the reign’ egg perfectly illustrates the most important events of the private life of the four crowned, and their achievements. 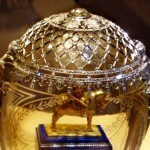 Made by the court jeweler Carl Faberge in 1911. Jewelry Master Henry Wigstrom. Gold, transparent green enamel, an opaque white enamel, opal light gray enamel, diamonds, rock crystal, ivory. Dimensions – 13.2 cm egg divided horizontally and vertically, belts, laurel green enamel, on the intersections of a cross studded with diamonds, tapes of intercepted. 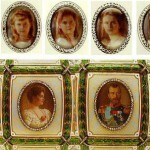 They form the eighteen panels, sixteen of which are miniatures of court miniaturist Vassily Zuev, consisting of seven oval portraits of the royal family of nine, and historical scenes of the reign of Nicholas II. The Historical scenes depict: the moment the holy coronation; ceremonial procession to the Assumption Cathedral, a ceremonial reception for members of the State Duma in the Winter Palace, House, ten Bosch in The Hague, seat of the First Peace Conference, the acquisition of the relics of St. Seraphim of Sarov, a monument to Peter the Great in Riga, unveiling in Poltava to mark the Bicentennial Anniversary of the Battle of Poltava, the Museum of Emperor Alexander III; opening of the Alexander III bridge in Paris in the presence of His Imperial Majesty. 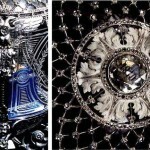 Under the portraits of Nicholas and Alexandra – medallions, which are visible under a flat diamond dates: “1894” year of the wedding of Nicholas and Alexandra, and “1911”, the fifteenth anniversary of the coronation of the year, both dates on the band with the inscription of Faberge Russian letters. At the top of the eggs placed the imperial monogram Alexandra by large flat diamond, framed by a small circle. 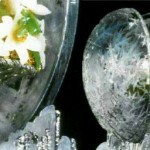 Bottom is also decorated with an egg a large diamond surrounded by smaller ones. 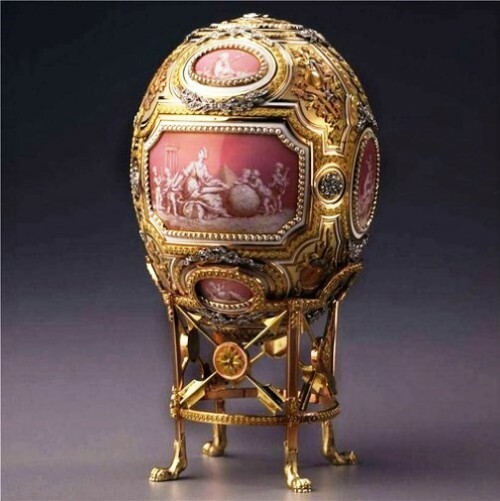 Field around the oval miniatures, as well as top and bottom of the eggs covered with translucent enamel pearl. 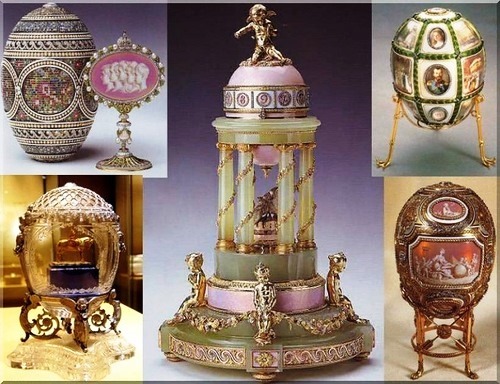 Along with the egg and preserved the original, covered with velvet, egg-shaped box, Nicholas II ordered the Faberge egg as a gift Alexandra for Easter in 1911. Stored in the collection of the magazine “Forbes”, New York. The United States. 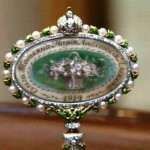 ‘The Prince’– a gift of the Empress Alexandra Feodorovna. Made in the style of Louis XV. Surprise – the two-headed eagle with a diamond miniature portraits of Prince Alexei (presumably a copy of the lost miniature). 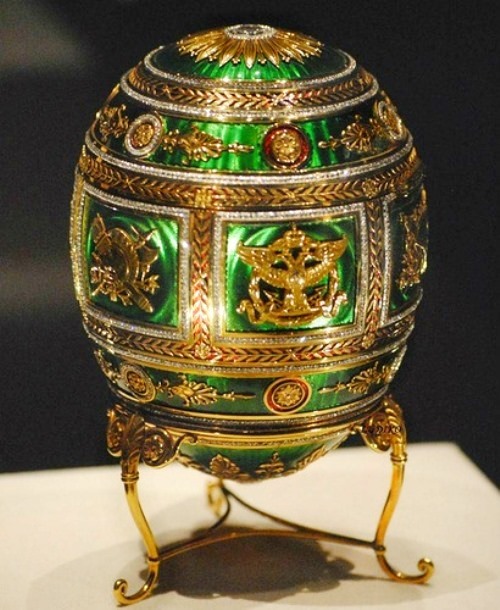 The egg is kept at the Art Museum of Richmond, Virginia, USA. 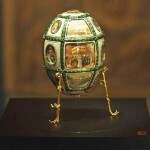 ‘Napoleonic’ egg, size – 11.8 cm Egg is made of yellow gold, platinum, ivory, which is covered with enamel. Precious stones – diamonds. Six panels on the egg with gold appliques double-headed eagle and the spoils of the Romanovs. The panels are separated by patterns of scrolls and leaves. Egg topped with a golden sun, decorated with diamonds. In the center of a large diamond with a crown and monogram of the Dowager Empress Maria Feodorovna. Surprise – 6-pannel folding screen, which shows the representatives of the regiments of the Empress. Miniatures were made by the court master Zuev. The panels are covered with green enamel and edged with diamonds. 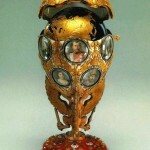 The egg was given by Nicholas II to his mother, Dowager Empress Maria Feodorovna on Easter 1912. Egg howled sold by the Soviet government in 1927 in the Hammer Gallery in New York. Now is stored in a collection of Matilda Geddings Gray Foundation, in New Orleans. The United States. 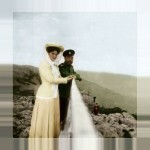 ‘Winter’ was a gift to Empress Maria Feodorovna. 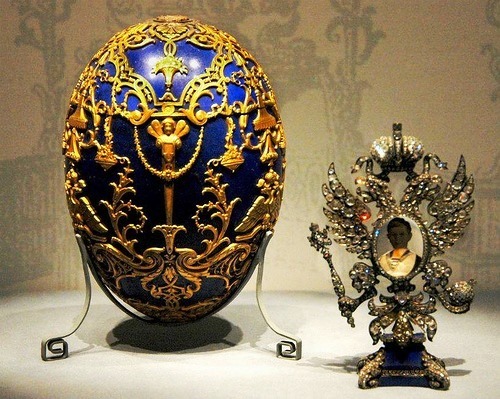 The most expensive egg paid for by Romanov (24 000 thousand). Produced in 1913 by order of the Russian Emperor Nicholas II by Faberge jewelry. Made of crystal, opals and diamonds. Surprise eggs – a basket of anemones, decorated with diamonds and emeralds. At the present time is in the collection of the Emir of Qatar. 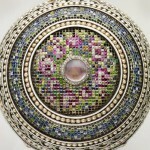 ‘Mosaic’ egg of Yellow gold, platinum, diamonds, rubies, emeralds, topazes, sapphires, garnets and pearls. Size – 9.2 cm of Surprise eggs are kept at two gold clasps. 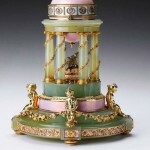 Surprise is a gold with pearls pedestal, covered with a transparent green and opaque white enamel. 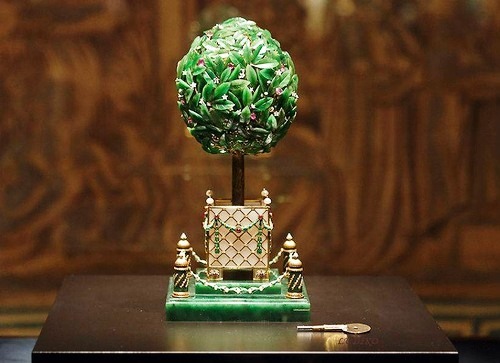 The pedestal is studded with diamonds and green garnets, crowned with an imperial crown. Plaque on the pedestal stands on one side of which shows the profiles of the five imperial children. 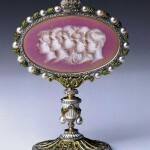 Profiles are made in sepia grisaille enamel on a background of parallel lines engraved, covered with opal pink enamel. On the other side of the plaques – a basket of flowers, made of pale sepia to pale green background. For opaque ivory enameled painted sepia curb children’s names and the date 1914. Gold surface under a pedestal engraved sun pattern. There is also engraved, probably by mistake, G. Faberge, 1914. The egg was made as a jewel. 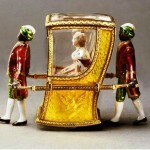 Presented by emperor Nicholas II, to his wife Empress Alexandra for Easter in 1914. Purchased by King George V and Queen Mary, stored in the collection of Her Majesty Queen Elizabeth II.